Your home is your castle and its decor is a unique artistic expression of your tastes and aesthetic. In order to keep your home decor looking fresh and up to date rather than stale, it’s important to pay attention to the trends as they shift and change. This is especially important if you are selling your home, because outdated decor can make a negative first impression on the buyer. 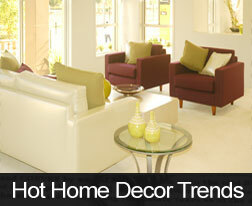 If you are planning to redecorate this year, what are the hottest trends when it comes to home decor in 2014? Benjamin Moore Paints has announced their 2014 Color of the Year, which is a powdery sky blue hue called “Breath of Fresh Air”. It’s a gentle pastel color that works well with neutrals such as brown, grey and white and can also complement other blue and green hues in the same color family. It looks sweet and modern and it is vibrant enough to make an impact while being pale enough not to draw too much attention to itself. Why not consider incorporating this light blue, or other shades like it, into your decor? Last year, the trend of the moment was color blocking. However, these days the hottest thing at the moment is patterns that have a white background and a historic themed repeating print. For example, this might include wallpaper, drapes or fabrics with a floral print or a vintage design on white. Another popular trend is geometric shapes, especially triangles and chevrons. These are often seen in bright and vibrant colors, sometimes also with a white background. Another interesting home decor trend of the moment is incorporating hand-made items into the room. This could include a hand-knit throw that is draped over a sofa, or an embroidered cushion. If you are crafty, you could make these items yourself. Otherwise, you could purchase these one-of-a-kind pieces from your local artisans or only at shops such as Etsy.com. These are just a few hot 2014 home decor trends to get you started on your decorating project. Be creative and have fun while decorating your home, so that you can create a unique and original place where you will feel happy and inspired. For more tips and information, contact your trusted real estate professional.